Products from our catalog with shapes or designs of dinosaurs. You will also find other similar animals, such as dragons and other monsters. Decorative button with the shape of a dinosaur in beige color. Perfect for needlework projects or patchwork, as well as scrapbooking, card making and other crafts.Content: Price is per unit.Diameter: approx. 24,5 mmMaterial: Plastic. Product Description: Sticker with a design of a dinosaur. Content: 1 iron-on sticker . Maximum Length: 90 mm. Material: Textile. Decorative buttons of small sized with the shape of dinosaurs in various colors. Perfect for crafts and projects of scrapbooking, cardmaking, patchwork, etc. Content: 15 buttons of 5 different models. Diameter: approx.16 a 18 mm. Material: Plastic. 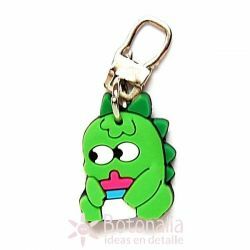 Product Description: Buttons with the shape of a dinosaur.Content: 12 buttons of 4 different models in 4 colors.Diameter: 25 mm approx.Material: Plastic. Iron-on sticker (patch) with an embroidery of a small dragon in green.Content: 1 iron-on sticker.Diameter: approx. 40 mm. Material: Textile. Iron-on sticker (patch) with an embroidery of a small dragon in yellow and green.Content: 1 iron-on sticker.Diameter: approx. 50 mm. Material: Textile. Iron-on sticker (patch) with an embroidery of a small monster in bright blue.Content: 1 iron-on sticker.Diameter: approx. 55 mm. Material: Textile.